In winter you need to pay special attention to dehydration of your hands and feet. Our Hand Scrub is besides a scrub also a skin care cream. Hand scrub makes your hands and feet soft. The peace and power of this exotic flower [Plumeria] is exceptional. The pure oil is exotic and very powerful. 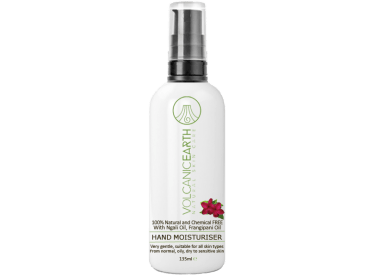 Beautiful Volcanic Earth™ product range with pure Frangipani Oil. It's also arguably the most popular flower in the world and is certainly a "jewel of the South Pacific". Plumeria is one of the most exotic of all fauna and flora with invigorating scents that are known to affect the way people feel. There is nothing quite like the sweet fragrance of Plumeria in flower to uplift your spirit ... It's no wonder more and more people (Melanesians) continue to use the Frangipani plant extensively for decorative, skin care and medicinal purposes to this day. Frangipani trees prefer dry, sandy soil in full sun. They don't like the cold and are deciduous (although in tropical climates they may remain evergreen throughout). Plumeria is an extremely durable plant and only authentic plants give the power of this special flower. There are over 100 different varieties of Plumeria. Frangipanis grow as high as 10 metres in tropical regions whereas in milder climates, their growth is restricted to shrubs or small trees. These plants have thick succulent branches, spaced well apart with long leather, fleshy leaves in clusters near the branch tips. Enjoy the fantastic feeling of our beautiful Volcanic Earth™ product range with pure Frangipani Oil. Why choose VolcanicEarth - Europe ? In our research institute our team scientists stand behind ingredients that are traditionally proven effective. Our focus is not only what nature gives us but what effect does is has on people, animals and nature. Each Volcanic Earth ingredient has been individually tested to prevent hypersensitivity or any kind of irritation to the skin. Luxurious Hand-Made Fair Trade Soap with pure Coconut Oil enriched with Frangipani Essential Oil.